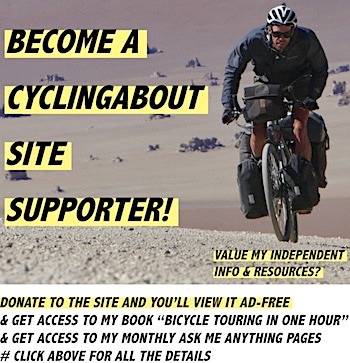 People ask me all the time whether they can go bicycle touring on their cyclocross bike – after all they don’t look all that different to a touring-specific bike. 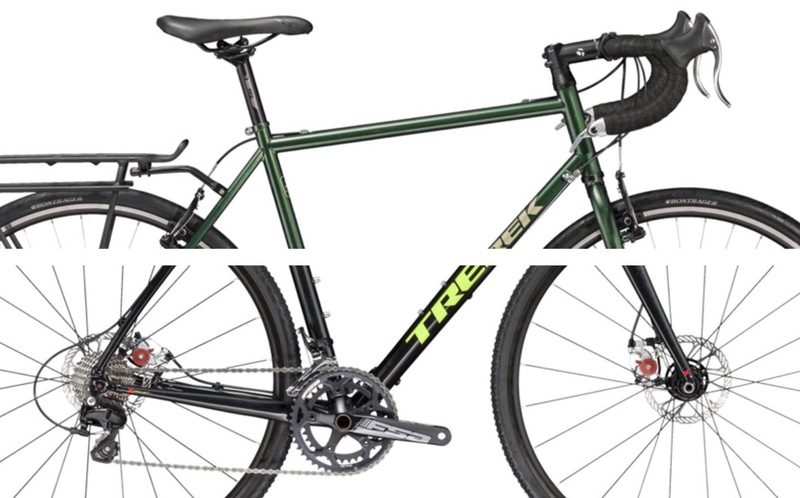 But how well will a cyclocross bike travel compared to a long-distance touring bike? Let’s take a closer look. There are three areas which I’ll examine that will determine how well a cyclocross bike will tour. The first is the frame geometry: this will compare the bikes handling and feel. 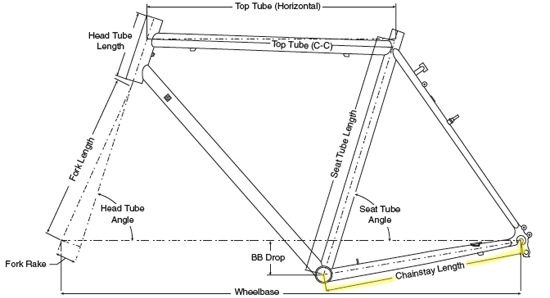 I’ll then discuss frame construction and the details your frame may need for a bike trip. Then I’ll look at part specification choices and how they may affect your travel experience. 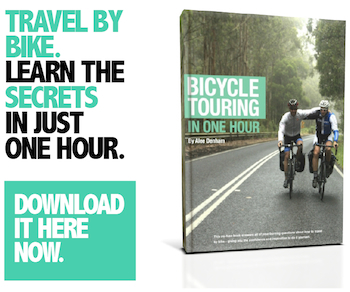 For an overview of all of the different types of touring bike, head to THIS resource. 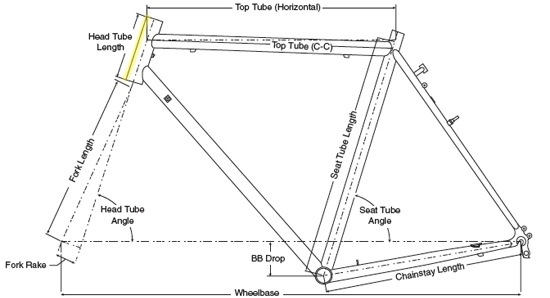 To learn about frame geometry in detail, head to Understanding Bicycle Frame Geometry. 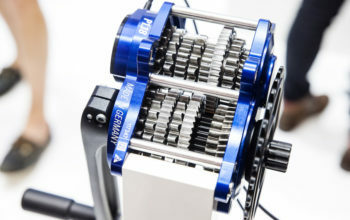 Steering: In order to compare the steering characteristics between touring and cyclocross bikes we need to look at ‘fork trail’ – the product of the head tube angle and the fork rake. This measurement gives us an idea how the bike will steer; lower trail equates roughly to a faster steering response while higher trail tends to dull the steering. 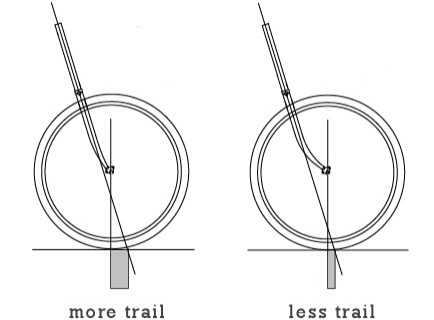 Touring bikes often vary in trail between 64-74mm with the tendency to be on the higher side, while cyclocross bikes often sit between 66-70mm with the tendency to be on the lower side. Given the fork trail overlap between between cyclocross and touring bikes, steering (on average) is largely similar. Headtube Length: Cyclocross bikes often have 20-40mm shorter headtubes than touring bikes – this is due to cyclocross racing being a shorter and more aggressive event than going on a bicycle trip. If you would like a more upright handlebar, headtube and steerer length will be an important factor in your decision. BB Drop: A cyclocross bike has a 5-15mm higher bottom bracket than a touring bike so that cx racers can pedal through corners. This results in a slightly higher centre of gravity, but the reality is a largely unnoticeable difference when travelling with panniers. Chainstay: Cyclocross chainstays are 20-40mm shorter than on a touring bike. The main issue with short chainstays is shoe clearance to your rear panniers, especially if you wear size US10 shoes or larger. 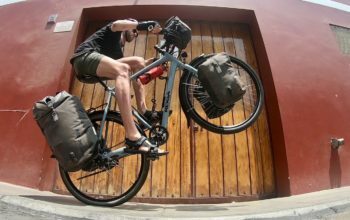 Keep in mind it’s possible to get your panniers to sit further back with well-designed racks (check out the Tubus Logo) and adjustable panniers (check out Ortlieb’s options). Wheelbase: A cyclocross bikes wheelbase is shorter overall by about 40mm due to the reduced fork rake and chainstay length. The overall effect works out to be slightly less stability at high speeds. Frame Stiffness: Stiffness is particularly important if you’re wanting to use both front and rear panniers – less stiff frames can sometimes result in ‘shimmy’ aka speed wobble. 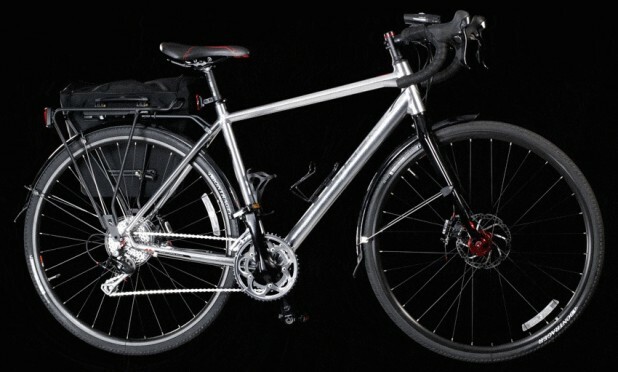 Touring-specific frames use larger diameter and often thicker-wall tubing in order to keep the bike rigid with loads. This adds weight to the frame, but allows the bike to handle heavy front loads very well. Cyclocross frames are often optimised to be lighter in weight, which can result in less-than-adequate frame stiffness when using front and rear panniers. Frame Eyelets: CX frames can sometimes offer one bidon mount, no rack mounts and no mudguard eyelets. Make sure the cross bike you’re looking at touring with has the eyelets you need for your adventures. Fork Eyelets: CX forks don’t always have eyelets for a front rack and mudguards, especially if the fork is made out of carbon. If you’re planning on using panniers and mudguards, check for fork eyelets! Comfort: You will find very little difference in terms of frame comfort between a cyclocross and touring bike. Bike comfort is mostly a product of tyre width, seatpost flex and saddle choice. You can read more about comfort seatposts HERE and about the different frame materials and comfort HERE. 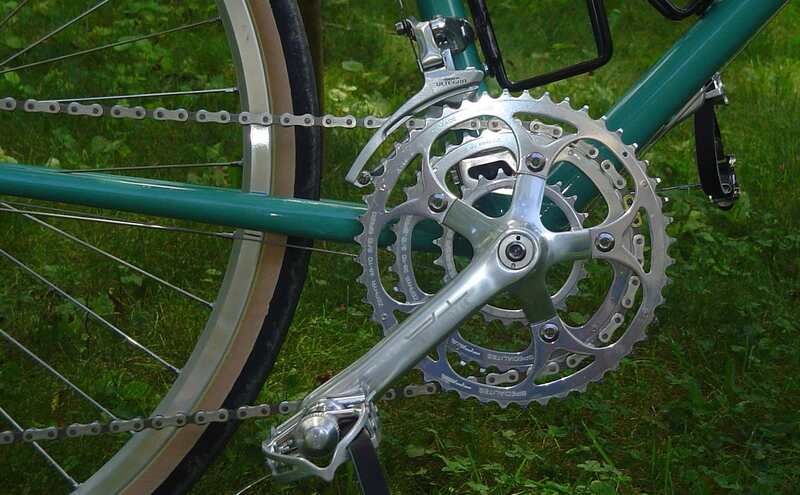 Gear ratios: Perhaps the most limiting factor on a cyclocross bike is the narrow gear range. The range is fine with light loads or for touring in flatter locations, but can be problematic with heavy bags on steep roads. Wheels: Cyclocross wheels are often just lightweight road wheels with low spoke counts and narrow rims. 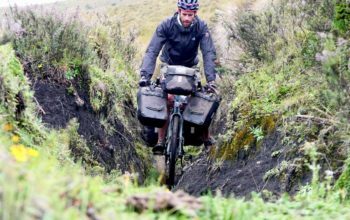 Bicycle touring demands heavy-duty wheels – especially if you’re carrying decent loads. If you’re planning on long distances and heavy loads, make sure the wheels are up to scratch. Tyres: Cyclocross tyres are best suited for dirt, and won’t offer much in the way of puncture protection or speed on sealed surfaces. This is obviously quite a quick and easy swap-out. 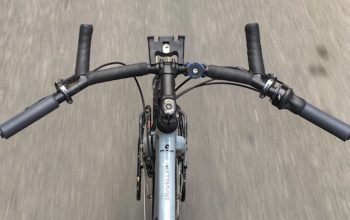 STI shifters: Integrated brake/shift levers are great until something goes wrong – but take note, there’s actually a really low chance of this. That said, in order to maintain simplicity, you’ll find most touring bikes are specced with barend or MTB shifters. If you’re carrying a light load across flatter terrain you will definitely benefit from travelling with a cyclocross bike. 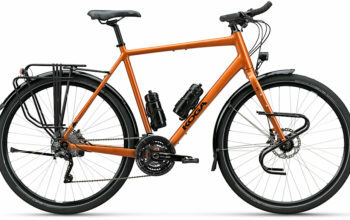 They are often 30% lighter in weight than a touring bike, and are better across multiple cycling disciplines: commuting, road riding and of course cyclocross racing. Cyclocross bikes are a true jack-of-all-trades machine. 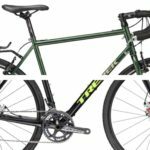 When it comes to frame geometry alone, cyclocross bikes will actually handle the demands of bicycle touring very well. With the occasional exception of chainstay length (for riders with large feet), the rest of the angles and measurements will likely go unnoticed. As I mentioned above, there are racks and panniers available that will clear your heels on cyclocross frames, even if you have boats for feet. Frame construction is a more important factor, especially if you’re planning on using front and rear panniers. With more than 10kg up front, a stiff frame is essential; I’ve experienced speed wobbles on frames which are not built to handle loads. Again, check that there is provision for your racks and mudguards on cyclocross bikes – not all manufacturers offer them. The biggest reason for choosing a touring-specific bike is for the part specification. You’ll get a much lower ‘granny gear’ for taking your equipment up steep hills, you’ll get heavy-duty wheels that will stay true and maintenance free, you’ll get kevlar-lined tyres with hardwearing rubber compounds, and you’ll get simple parts which are easy to adjust and fix, like barend shifters and cable disc brakes.